Ophthalmology Consultants offers comprehensive cornea and external disease services by fellowship-trained cornea specialists Dr. Steven F. Lee and Dr. Senthil Krishnasamy. The cornea is the outermost part of eye. This clear, transparent membrane covers other eye anatomy including the iris and pupil. The cornea functions as a protector for other eye components and also provides the eye most of its optical power. DSEK (Descemet’s Stripping Endothelial Keratoplasty) – is a corneal transplant technique where the unhealthy, diseased, posterior portion of a patient’s cornea is removed and replaced with healthy donor tissue obtained from an eye bank. Unlike traditional corneal transplant surgery, the DSEK procedure utilizes a much smaller surgical incision and requires no corneal sutures. DSEK usually results in more rapid visual recovery and also reduces the risk of sight threatening complications that may occur with a corneal transplant, such as intraoperative expulsive hemorrhage or post operative traumatic would rupture. A corneal ulcer forms when the surface of the cornea is damaged or compromised. Ulcers may be sterile (no infecting organisms) or infectious. The symptoms associated with corneal ulcers are red eye, pain, tearing, discharge, white spot on the cornea, and light sensitivity. Treatment includes eye drops and ointments. Ocular herpes or zoster are viral infections of the eye. This causes pain, redness and decreased vision. It is treated with antiviral drops and pills. If it is not treated it can lead to scarring of the cornea and vision loss. Pterygium is a raised, wedge-shaped growth of the cornea and conjunctiva. It is most common among those who live in tropical climates or spend a lot of time in the sun. Symptoms may include irritation, redness, and tearing. For some, the growth remains dormant; however, in other cases it grows over the central cornea and affects the vision. As the pterygium develops, it may alter the shape of the cornea, causing astigmatism. If the pterygium invades the central cornea it is removed surgically. Often appearing in the teens or early twenties, keratoconus is a progressive disease in which the normally round cornea thins and begins to bulge into a cone-like shape. This causes distorted vision. Treatment includes contact lenses or surgery. Due to its anatomical position, the cornea is prone to many types of injuries. From superficial scrapes to embedded foreign bodies, without proper eye protection and safety, the cornea may be the victim of various types of eye injuries. Many minor scrapes or scratches may be treated with topical antibiotic drops or ointments. Sometimes, placing a pressure patch or bandage contact lens over an injured cornea is required for proper healing. Improper contact lens care or over-use can contribute to various corneal conditions. Corneal ulcers are caused by corneal tissue loss, that can occur due to bacterial or viral infection. Proper contact lens maintenance and wearing contact lenses as directed can help avoid painful corneal problems. 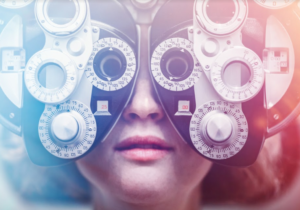 If you you would like to know more about any of these procedures or would like to set up a consultation with one of our specialists, schedule an appointment with Ophthalmology Consultants today! Lamplighter Square Center in South St. Louis County, and the St. Louis Eye and Surgery Centers in Des Peres, MO.